Announced last year at Comic-con, though apparently no forward momentum on it until now, the Captain Canuck movie is still on it seems. According to THR, Mind Eye Entertainment is producing the film and they’ve hired Canadian Screenwriter Arne Olsen to pen the script. The film is based on the comic book character created by Richard Comely and was intended to be a cross between Flash Gordon and Captain America. 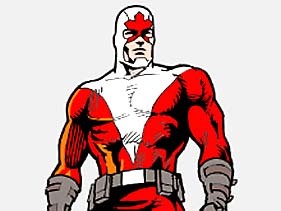 The first Captain Canuck patrols Canada in the (then) futuristic world of 1993, where “Canada had become the most powerful country in the world.” He was the costumed agent of the Canadian International Security Organization (CISO). Let’s hope they go a different route for the movie.